DC Comics' superheroes are teaming up with Sackboy in LittleBigPlanet's upcoming DLC. Sony's favorite mascot, Sackboy, is partnering with the spandex-wearing superheroes from the DC Comics universe. 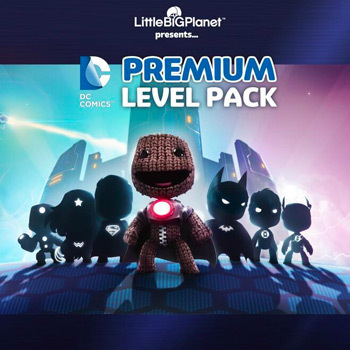 Cyborg, Wonder Woman, Superman, Batman, Green Lantern, and Flash are all joining the LittleBigPlanet crew when Sony releases the 'DC Comics Premium Level Pack' this week. The announcement came in the form of a tweet made from LittleBigPlanet's official Twitter account this morning. A teaser image, that's as ominous as it is ridiculous, shows Sackboy leading the heroic crew. The upcoming level pack will probably be very similar to the Nightmare Before Christmas costume pack that was released in October. Though, this one will have fewer tombstones, far more capes, and gives Sackboy the ability to wall jump and glide. Sony has not yet revealed the pricing details, but previous packs sold for $4.99. However, considering that this piece of DLC reportedly adds a couple of new abilities, it might be a bit more spendy. LittleBigPlanet has become one of Sony's most important first-party titles. So far, the publisher has released five games in the franchise's main series. Plus, a spin-off called Sackboy's Prehistoric Moves was released in 2010. However, it would be nice to see Sackboy make the transition to the PlayStation 4 in 2014. Are you listening, Sony?